It is very convenient for users to record the screencasts directly from their browser and further share it with others. 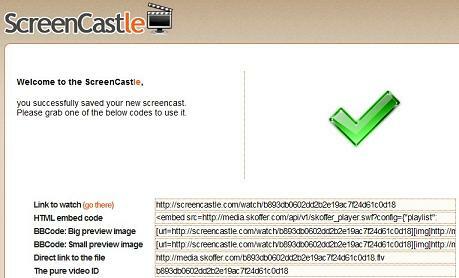 This not so easy task can now be effortlessly done via ScreenCastle. This service is absolutely free and can be easily accessed too. The application doesn’t require users to undergo complications of a setup installation. The only thing required is to visit the website of ScreenCastle, you don’t even need to sign up or create a new account even if you don’t have one. Once the website opens you are entitled to start recording. There will be a red icon present on your page. The button reads the message “Start Recording” and on clicking this button will start recording the screencasts. The application also allows you to set the resolution of the recorded video. This also helps you make the sharing and recording session all the more meaningful. After the completion of the recording process, users can view the media and then save it before further processing. The best thing about it is that you can view the recorded media directly or can even embed it into blogs. The only prerequisite for this application is that you need to have Java installed into your system. The installation of Java helps launching the recorded session successfully. The service is most useful when the user needs to share or demonstrate certain media like some short tutorial teaching how to install a driver or configuring your system setup.